GOLDEN, Colorado, August 16, 2012 (ENS) – The world’s largest, longest hydrogen fuel cell electric vehicle and hydrogen fueling demonstration indicates that automakers could bring FCEVs to market in the 2014-2016 timeframe. During the seven-year real-world validation project, the U.S. Department of Energy’s National Renewable Energy Laboratory deployed 183 vehicles travelling 3.6 million miles through 500,000 trips, resulting in 154,000 hours of second-by-second data delivered to NREL. The project also deployed 25 hydrogen fueling stations that produced or dispensed 152,000 kilograms of hydrogen through more than 33,000 fueling events. Because hydrogen is an explosive gas, safety issues were carefully analyzed, but “no fundamental safety issues were identified,” said Keith Wipke, acting manager of NREL’s Fuel Cell and Hydrogen Technologies Program and the report’s lead author. “The project results show that fuel cell electric vehicles have advanced rapidly,” said Wipke. “As vehicle manufacturers and other researchers worldwide continue to focus on the remaining challenges of balancing durability, cost, and high-volume manufacturability, there is optimism that manufacturers will introduce FCEVs to the market within the next few years,” he said. Fuel cell cars run on hydrogen gas rather than gasoline. In the car’s fuel cell stack, an electrochemical reaction occurs between hydrogen stored in a tank onboard and oxygen in the air that converts chemical energy into electrical energy to run the vehicle. The only emissions are water vapor and heat. NREL’s Learning Demonstration project started in 2004 with four major vehicle manufacturers – General Motors, Daimler, Hyundai-Kia, and Ford – and three energy partners – Shell, BP, and Chevron – contributing data for NREL analysis. Project costs were shared 50-50 between industry and the Energy Department’s Office of Energy Efficiency and Renewable Energy. Later, the Energy Department’s California Hydrogen Infrastructure Project, executed by Air Products and Chemicals, Inc., contributed data on its fueling stations. The three primary goals of the project were to evaluate fuel cell durability, vehicle driving range, and on-site hydrogen production cost and compare to Energy Department targets. The targets were: a 250-mile driving range, a 2,000-hour fuel cell durability and a $3 per gallon gasoline equivalent for hydrogen production cost. “We received final project data from our industry partners in October 2011, and have completed our analysis across the entire demonstration period,” he said. Technical results showed that at least one of the four industry teams exceeded each of the FCEV targets for driving range and fuel cell durability. One team showed a projected average fuel cell stack durability of 2,521 hours. One team achieved a 254-mile driving range and another FCEV showed itself capable of reaching a driving range of up to 430 miles. Low on-site hydrogen production costs were difficult to demonstrate through this project because current hydrogen stations were not designed, constructed, and used as full-scale commercial stations, Wipke explained. While this project did not achieve the Energy Department’s hydrogen cost target, an independent review panel examined the issue of hydrogen production costs and determined that the production cost target could be met for at least one pathway in commercialized hydrogen stations at sizes comparable to gasoline stations. 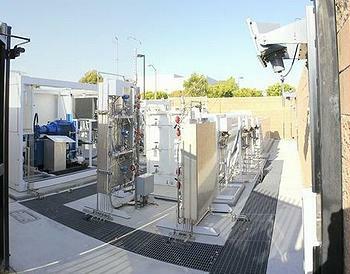 That pathway was hydrogen produced from natural gas. With increased availability of low-cost natural gas, hydrogen costs can be decreased even further, Wipke said. The report is designed to help industry and the Energy Department evaluate progress toward market needs and the agency’s targets, and to focus research and development efforts in areas where technical barriers still exist. To protect the commercial value of these data for each company, the team established the Hydrogen Secure Data Center at NREL to house the data and perform the analysis. While the raw data are protected at the data center, the public may see aggregated results through composite data products, which communicate technical results without revealing proprietary data. To ensure value was fed back to the hydrogen community and key stakeholders, the team published composite data products twice a year and presented at technical conferences. Click here to view the full report. 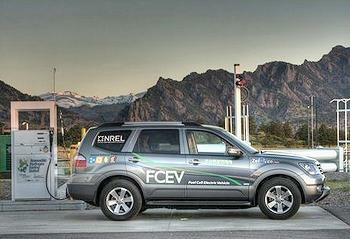 For more information, visit NREL’s Hydrogen Fuel Cell Vehicle and Infrastructure Learning Demonstration website.